4:41 p.m. — We’re here, live from Mulligans where they’re serving free Coors Light. My sincerest apologies, Notre Dame-Pitt has had me on the edge of my BCS-upholstered seat. But I’m here just in time to witness an IEO Speedwagon pick. It was wonderful. Ifo Ekpre-Olomu is my favorite Duck of 2012. That could change in the next two hours, but for right now, I’m on your team, IEO. And no one could be as maddening to hometown fans as Matt Barkley. His pass down the sideline two plays prior was one of the best passes — college, pro, NBC televised drama — that I’ve seen all season. Quick update: Oregon is up 14-3 on a DAT touchdown catch and a Josh Huff touchdown catch (who, through just a quarter, has three catches for 73 yards and a score). Oregon 14, USC 3. 4:51 p.m. — Oh, you want to know more about the beer at Mulligans? It costs zero dollars. And there’s the first Mari-OH NO moment of the game. Should’ve been picked. Happy it wasn’t, because Kenjon Barner takes the next play (a read-option on 3rd-and-5) 27 yards TO THE HOUSE. Ducking, dodging, dipping, not diving, he’s like Patches O’Hoolihan’s favorite player. Oregon 21, USC 3. 4:55 p.m. — Get ready, folks. This could be a barn burner. Not two plays after Oregon stretched their lead to 18, Matt Barkley answers the call with a 75-yard bomb to Marquis Lee, Oregon’s first time getting victimized by college football’s most dynamic receiver. I don’t think this is the last time I’ll be typing his name. Oregon 21, USC 10. QuackTown’s own Kenny Shelton is there. We think that’s pretty cool. 5:04 p.m. — Oregon’s driving — again — inside USC’s 10, courtesy of Kenjon Barner running like, well Kenjon Barner. His 41-yard run put the Ducks inside the USC 30, but he’s been doing it all game. Oregon is running over USC right now, passing over them, hopping over them, doing the worm over them, whatever.And Barner does it again, one play later, eluding three USC wannabe-tacklers for a wonderful little seven-yard scamper. He’s rushed for 136 yards and two TDs on just 12 carries. A “Leaping” penalty pushes the Ducks back to the eight for the extra point and USC blocks it. In related news: That’s Rob Beard’s first missed extra point this season. Oregon 27, USC 10. 11:27 to play in the second. 5:14 p.m. — In more related news: The Ducks aren’t supposed to be the team that incurred two early, costly penalties. USC was, dammit. And Oregon’s run defense is looking suspect as well. Curtis McNeil should not be allowed to work in that much space, and Silas Redd is running straight downhill. If it weren’t for the brilliance of the IEO Speedwagon, this would be a 27-17 game, verging on 27-24. Not as suspect as USC’s defense, but suspect nonetheless. Marquis Lee’s 3rd down catch-and-run set USC up inside Oregon’s 10. 5:18 p.m. — How?!?!?! Matt Barkley escapes the entire Oregon defensive line, three masked kidnappers from the film 3 Ninjas and an army of zombies en route to throwing his second touchdown pass of the game, a seven-yarder to Robert Woods. Oregon 27, USC 17, 5:59 to play in the second. 5:23 p.m. — But fear not, Duck faithful, Marcus Mariota took a read-option keeper 58 yards, then hit Daryle Hawkins for another 16 yards and a touchdown. Oregon took just 56 seconds to deflate the mood of 90,000. That’s pretty neat. Oregon 34, USC 17, 5:03 to play. 5:26 p.m. — The pressure finally get’s to Barkley, and USC’s golden child absorbs a hit, but throw’s a pick to Kiko Alonso, the lead singer in the 2012 Ball Hawk Eugene Crew. 5:29 p.m. — In an appearance rarer than that of an American Bald Eagle in Connecticut, Oregon sends out pin-cushion Rob Beard to kick a 41-yard field goal. He then proves why his presence is rarer than an endangered species. 5:30 p.m. — How do you parlay the momentum of a missed field goal into straight rocket fuel? Throw a 77-yard touchdown pass to your third best wide out, Nelson Agholor? Great answer, Mr. Barkley. Oregon 34, USC 24, 2:37 to play in the second. 5:35 p.m — Right here, a witness to the ultimate Mari-OH NO moment, one he executes flawlessly on a semi-regular basis. He fumbled an exchange on a read-option, leaving it in Barner’s kitchen for far too long. The ball hit the turf, USC recovered with 1:24 to play and Barkley hits Redd for a screen, before doubling down on a draw play to McNeil. This is maddening. The most maddening of all? It came on a read-option, Oregon’s bread-and-butter. It’s like choking on air. Oregon’s defense now has lost the ability to recognize a screen. Temporary amnesia has set in, only explanation. 5:40 p.m. — Whew. That was the first justified “whew” of the season. On a 2nd-and-goal bubble, Marquis Lee, attempting to extend the play, coughed up the football. Just bring it on in, fellas. 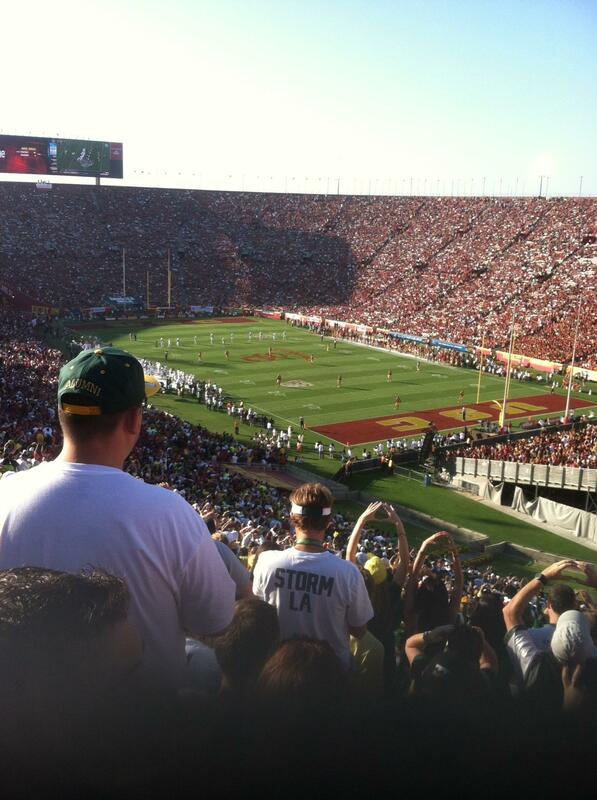 Score: Oregon 34, USC 24. Stats: Kenjon Barner — 169 yards and two TDs on 16 carries. De’Anthony Thomas — 17 yards on three carries; 46 yards and a TD on four receptions. Marcus Mariota — 213 yards and three touchdowns on 14 of 16 passing; 72 yards on 11 carries. Josh Huff — 73 yards and a touchdown on four receptions. 6:03 p.m. — We’re back, but I’m at McDonald’s. See you soon. 6:18 p.m. — Silas Redd punctuates USC’s opening second half drive with a 2-yard run for a touchdown, the game’s ninth TD, but its first boring one. Oregon 34, USC 31, 9:59 to play in the third. 6:24 p.m. — If that wasn’t the most exciting two-yard run since Barry Sanders, I don’t know what was. KB got as shifty as humanly possible on his way to a huge third-down conversion. 6:28 p.m. — And if a tense 3rd-and-short wasn’t enough, try the first tense 4th-and-short of the season. No matter, however, Kenjon’s got this. This game is tense, by the way. But too tense so that Kenjon Barner to prove that he is the best college football player in the nation. I’m dead serious. Collin Klein? Nope. Not buying it. KB makes defenders look like tackling dummies 20+ times a game. This time, they only had to endure the Medusa-like fate for nine yards. Barner, however, has put up 212 yards on 23 carries. Oregon 41, USC 31, 5:14 to play in the third. 6:33 p.m. — Marquis Lee is really, really good at football. And his return on the ensuing kickoff is exhibit 1,349 B. 6:37 p.m. — First one to 70 wins. Silas Redd scores a touchdown, and I’m sad. Oregon 41, USC 38, 2:32 to play in the second. 6:41 p.m. — Kenjon Barner is averaging 10 yards a carry at this juncture, and it looks like those 10 yards come easier to him than his next breath. And on that note, he was a heel away from turning 21 yards into another 60. 6:43 p.m. — You know what a good running game sets up? An easy play action passing game. Mariota hits a wide open Josh Huff, in stride, for 36 yards and a touchdown. Mariota has passed the ball way better than expected today, has been a huge factor and found Huff twice in the endzone. Whatever version of the Oregon offense this is, I like it. Oregon 48, USC 38, 1:19 to play in the third quarter. 6:47 p.m. — End of the Third Quarter. 6:54 p.m. — IEO drops another sure-pick, but thankfully, it doesn’t matter. USC punts, Oregon ball, 14+ to play. 7:02 p.m. — Barner has been putting this offense on his back. Remember when I wrote that breathing looked more laborious for him than breaking tackles did? He would have to assert more effort to blink than he does when he rushes for 10 yards. 7:05 p.m. — Call it a quatro, ’cause Kenjon Barner just scored his fourth touchdown of the game, a five-yard scorcher around the edge. Heisman, Heisman, Heisman, Heisman, Heisman. He now has 288 yards and four TDs on 32 carries (a cool nine yards per carry) thus far, against what was billed as his stiffest competition of the season. Hey America, see what happens when he’s allowed to play past the second quarter? Oregon 55, USC 38, 9:15 to play. 7:14 p.m. — Oregon got jobbed on a phantom pass interference call. Naturally, this drive will end with a USC touchdown. 7:17 p.m. — Barkley hits TE Randall Telfer for a three-yard TD. Naturally. Oregon 55, USC 45, 5:27 to play. 7:19 p.m. — USC throws a gorgeous onside kick at Oregon, right at the weak side. The ball took a perfect bounce, and USC failed to recover the ball before the ball hopped out of bounds. But then, the six scariest words in modern football: “The previous play is under review.” USC might get this ball back. 7:23 p.m. — BUT THE DON’T!!!!!!!!!!!!!!! Oregon ball, midfield. Lane Kiffin looks like someone just called him Dennis the Menace. 7:25 p.m. — Have I mentioned that this game is tense? 3rd-and-three from the USC 43. And Oregon calls a timeout. I don’t think Oregon has called five of those this entire season. And it doesn’t work. Barner bobbles the pitch on a somewhat awkward 3rd down call, bringing on Jackson Rice for the first time all game, 3:35 to play. 7:30 p.m. — 4th-and-5 USC, at their own 17, for the game. And Barkley blows it! Overthrows Lee, who was two yards short of the marker anyways, and Oregon takes over on downs, up 10 with three minutes to play. 7:32 p.m. — Kenjon Barner has had more touchdown runs called back on flags than most RBs score all year. And the worst part about it? It puts Barner’s 300-yard game in jeopardy. He now sits at 297 yards on 37 carries, but the Ducks are stuck in a 3rd-and-16. BUT IT DOESN’T MATTER AT ALL CUZ KENJON BARNER IS THE MEANEST MAN IN AMERICA!!!!!!!!!!!!!!!!!!!!!! He puts it in from 22 yards out, splitting the USC defense in two, then finishing it off untouched. Barner now has 324 and five touchdowns on 38 carries. New school record, 33 yards shy of the conference record. Oregon 62, USC 45, 1:58 to play. 7:36 p.m. — USC’s death rattle sounds like 90,000 groaning Angelinos. 7:40 p.m. — Oregon sacks Matt Barkley for the first time all night (1:12 to play), for whatever that is worth. No answers for Oregon’s O, lack of USC depth hits ’em hard. 7:42 p.m. — Barkley throws his fifth TD pass when it really doesn’t matter. The 50 hurts Chip, says Chip’s disappointed face. Barkley wasn’t a schlub today, far from it, in fact. He threw for 484 yards and five TDs on 35 of 54 passing. The worst part about it for USC fans? None of it mattered. Oregon 62, USC 51, :01 to play. 7:45 p.m. — Oregon runs all over USC, throws all over USC and generally treats them like a rag doll en route to the 11-point win. Game Ball: Marcus Mariota threw for 304 yards and fouur TDs on an unreal 20 of 23 passing, yet Kenjon Barner walks away with the game ball, by rushing for 321 yards and five TDs on 38 carries, setting a school record in the process. Final: Oregon 62, USC 51. 7:48 p.m. — For all who stuck it out, thank you a million times over. Nelson, OUT.